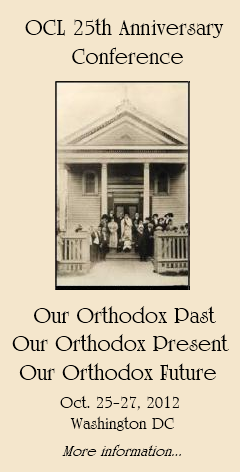 I saw the largest and best part of the Orthodox Church in the Diaspora, and I understood how exalted the name of Orthodoxy could be, especially in the United States of America, if more than two million Orthodox people there were united into one church organization, an American Orthodox Church. OCL is an independent, national, Pan -Orthodox, 50l C 3 non profit, educational association, incorporated in State of Illinois March 17, 1988 for the purpose of advancing the renewal of the Orthodox Christian Church in the United States: by: advocating the laity remain part of the concilar governance process which provides balance to the hierarchy and clergy all working together in governance, spiritual and other matters to insure accountability and transparency in the affairs of the church; OCL is committed to establishment of an administratively and canonically unified self-governing Orthodox Church in the United States. 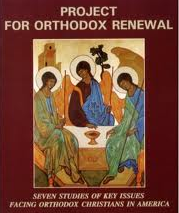 Create a consensus among Orthodox Christians in North America (hierarchs, clergy and laity) that it is urgent to establish an administratively united Orthodox Church in North America that is autocephalous, i.e., an independent, self-governing Church whose Primate is locally selected by the hierarchy, clergy and laity of North America. Continue to advocate the restoration of proper order in the Church, by establishing an Accountability Task Force to address abuses, improprieties and irregularities that are harmful to the spirituality and mission of Orthodoxy. Continue to advocate conciliarity in Church governance that enhances Unity and the spirituality and mission of Orthodoxy. 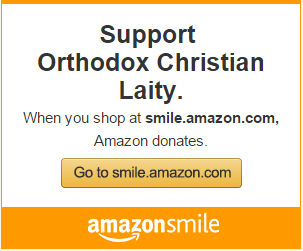 Continue to encourage Orthodox Education and Spiritual Renewal through Christ-centered publications, educational programs, information services and advocacy efforts.